Over the years we have learned that the dog that we think we are taking home is never the dog that we adopt. We adopted Brando in 2010 a couple months after we lost our senior German Shepherd. Our senior shepherd had a very easygoing personality. He was confident without being aggressive which made him the ideal companion for our reactive, nervous, female German Shepherd, Stella. We were looking for a dog with a very specific personality to keep our household balanced. We evaluated several dogs from German Shepherd rescue, the ASPCA and Helping Hounds before a Helping Hounds volunteer recommended Brando (then Rebel) to us. When Brando and Stella first met it was an immediate match. He laid in the grass calmly as she ran around playing frisbee. Periodically she would walk up to Brando and “check-in” with him, giving him a nudge with her nose or letting him sniff her rear before returning to playing. When Stella is nervous Brando comforts her. He licks her face, sniffs her rear or just sits down next to her. He can occasionally be lured into a game of chase or steal-the-toy but can generally be found sitting on the couch next to a heating source. Brando was about 2 years old when we adopted him. Helping Hounds identified Brando as some sort of hound/pitbull mix. Brando is definitely part hound dog. He loves to dig in the yard and can sniff out any animal, whether it is a bird or a snake. Brando’s hound adventures have led to snake bites and one very unfortunate mouse dinner. We do our best to feed his strong prey drive with puzzle toys and hiding treats around the house. We decided to get a DNA test to find out what other breeds Brando was mixed with. The results showed that Brando is a chow, foxhound, boxer mix. His coat is more hair-like, like a boxer. He has some areas where his skin has folds and thicker fur, like a chow. Brando developed skin sensitivities in the areas with extra folds or fur. He would scratch and bite these areas until they became raw and infected. After his worst flare-ups, he would have to be treated with steroids to fully recover. Steroids were very hard on Brando’s body and not worth the side effects for us. We had worked with Dr. Polly when our senior Shepherd had skin issues so we knew that she would be able to help Brando. We initially tried acupuncture and Chinese herbal therapy. While the acupuncture treatments did provide Brando with some relief, he was not good about sitting still to have the needles inserted or stay still for the 20 minutes that they need to stay in to be effective. We decided that his stress over the treatment cancelled out any benefits that he was getting. We noticed a difference with the Chinese herbs. We gave it to him daily for a couple months and then on/off for cycles of a couple weeks at a time when he had flare ups. We even mixed it with oatmeal and peanut butter to make allergy treats. Brando’s unique breed mix gives him a bit of an awkward stance. His front legs are slightly shorter than his back legs. This combined with the stress that he puts on his front legs digging and pouncing led to lower back pain. He is very sensitive about having his lower back touched. He flinches anytime you rub or scratch him along his spine, almost like he is ticklish but it seems to cause him pain. We knew that he would benefit from chiropractic care from Dr. Polly but she couldn’t adjust his spine because of the touch sensitivity. Dr. Polly recommended that we look in to a K-9 topcoat. This is a spandex, compression suit that is used on dogs with anxiety, allergies and other sensitivity issues. The topcoat was a huge success. When he has the suit on you can rub his back without him flinching and Dr. Polly can adjust his spine to relieve his back pain. Brando wears his topcoat during allergy flare ups, whenever he receives an adjustment and after stressful situations. Brando used to be a nightmare after getting a bath. During allergy flare ups he gets a bath every 7-10 days. Before the top coat he would run around the house knocking over furniture and digging into the bed and carpet for several minutes before he calmed down. Now after his bath we towel-dry Brando and put him in his topcoat. He goes to his favorite chair and curls up without incident. Brando had x-rays to confirm that he didn’t have any herniated disks or other structural problems that could be causing the pain. His x-rays were clear but they did show that he had a bullet in his side. The bullet does not cause him any pain and would cause more problems now if it was removed. Brando was rescued from a high-kill shelter in South Carolina by Helping Hounds. We can’t imagine what the first 2 years of his life were like but have been happy to spoil him for the past 7 years to make up for it. Brando now has 3 topcoats and an assortment of clothing options. He seems to be calmest when he is swaddled in something. On cold nights, he is happy in his topcoat and underneath a fleece blanket in front of the wood stove. Even after all these years he still seems to be a South Carolina dog. At 3:00am the morning of July 6, 2017… I am sound asleep until I hear a cat cry. Just once. Thinking it was one of our 2 cats getting sick, the odd cry before a hairball comes out, I didn’t think much of it and fell back to sleep. Shortly after I awoke again to hear one of our dogs tails thumping like mad. Our female Labrador, Alex, loved to drag things such as socks or shoes to her bed. Thinking she had dragged a flip flop of my husband's I wasn’t going to investigate. Her tail would not stop. She was extremely excited about something. Waking up enough to realize I should rescue that shoe, I was surprised to find it was Oreo laying beside her bed that had Alex all excited. This was unusual behavior. Alex loved Oreo sometimes more than he could tolerate. It was then I realized just how still Oreo was beside her. I quickly picked him up to find him limp in my arms. Thinking he was just trying to be still so Alex would leave him alone, I put Oreo down in a different spot on the floor thinking he would take off. Instead his legs, mostly the right front, collapsed beneath him. I picked him up again and took him to my walk in closet where I could turn on a light and tried it again. Same thing. In disbelief I tried again, same thing. Oreo could not support himself and was now also panting. I quickly woke up my husband and told him we had to leave. Something was very wrong with Oreo. We quickly took off for Veterinary Medical Center upon which Oreo was immediately taken back and put on oxygen. How could this be happening???? Oreo was completely fine earlier in the day/evening. Nothing was unusual about how he was acting or his activities. My first thought was that Oreo had passed a clot. A radiograph was done to check Oreo’s heart. Although it was found to be slightly enlarged everything else appeared normal. It was recommended that Oreo remain at VMC (this is now 4:30am) until the morning when - as luck would have it - a Cardiologist would be there later in the day. Our hope was to have an echocardiogram performed to rule out Oreo’s heart. So tough to leave at that point and to go on about our day. Knowing Oreo was in the best of care we had no choice but to wait it out. By 11:30am, it was found Oreo’s heart was normal. This led to the next step, concerns of neurologic disease. And with this the recommendation for Oreo to be transferred to Cornell University Hospital in HOPES of getting into a neurologist ASAP. Again being told that the waiting list for an appointment could be a month or more, our best bet was to pick Oreo up ASAP from VMC and go immediately to the Emergency entrance of Cornell University. Fortunately for us and Oreo he was quickly seen. I could go on about all the findings and transpiring that occurred in the days to follow but here is the outcome. The following day after a MRI was performed Oreo was diagnosed with having Ischemic myelopathy (C2-C4). He had a lesion on his spine that was quite large - a stroke to his spine, not his brain. All other bloodwork and testing proved normal. Oreo fell into the small subset of cases that did not have an underlying disease to cause this occurrence. Research showed that the majority of cats could return to a normal or near normal lifestyle with supportive care and time. In Oreo’s case this lesion to his spine was quite large leading to a potential recovery of weeks or months. Oreo spent his 8th birthday at Cornell. We were able to visit him that day. We found our sweet boy quiet, but aware, unable to walk, shaved and bandaged, and so very sad. On July 10th Oreo was brought home to receive nursing care and at home physical rehabilitation. Unable to walk, Oreo needed to be placed in his liter box on his side to go to the bathroom, supported upright to eat and drink, turned over from side to side every several hours to prevent pressure sores and respiratory complications, and have various range of motion, weight bearing exercises performed several times a day as well as massage of all limbs to all keep the neuropathways open and responding. Recommendations were made for laser therapy to help stimulate cell regeneration and increase blood circulation and Electo-acupuncture for treatment of pain. I must say it was a bit overwhelming. Oreo was quite tolerant of these at home exercises, most of them, in the beginning. Knowing it was never said that he wouldn’t walk again is what got me through and pushed me on to keep working with Oreo even as he began to fight back, get mad, hiss, push. To me he was mad and the fighting back was him getting stronger! July 17, 2017…Our first visit to Care Pet Therapy. Oreo received a consultation with Dr. Flaherty. It was recommended Oreo have twice weekly visits of physical rehabilitation with Lis or Jenn and weekly visits of acupuncture with Dr. Flaherty. We started with physical rehabilitation visits which included laser therapy on Oreo’s neck. Water treadmill therapy was attempted on two separate occasions with Lis, but being a cat Oreo's tolerance was minimal and not ideal. Oreo did work on the dog treadmill on a couple of visits. Much better than the water but a little to fast on its lowest speed. We were given more exercises to work on at home involving various exercise balls to hang over and do stretches with as well as the continual exercises of bending all his limbs, elbows, feet, massaging them to keep those neuropathways open. July 27, 2017….Oreo has been to see Lis earlier in the day for a walk on the treadmill, stretches, and laser therapy. That evening I could not believe what I was seeing as Oreo rocks himself back and forth and attempts to stand. 3 weeks after Oreo’s incident it is the beginning of him finding his way back to walking on his own. Over the next week plus he continued to get himself up more and more and walk with a drunken stagger gaining more and more strength. Oreo continued with biweekly visits with Lis and several visits with Dr. Flaherty for acupuncture. Each visit showed improvement as Oreo continued to get stronger and fight his way back to a life of normalcy. Today, November 6, 2016, 4 months from Oreo’s incident….Oreo is now walking on his own. What started as a drunken stagger and falling over every few feet has now become almost normal. Oreo is able to go up and down stairs slowly and supervised, and he can now do a full flight. He still is a little slow with his right front leg, and I can hear him coming with a slight thud in his walk. Oreo is my purring love of a cat again. He is such a people person and would spend all day snuggling with you if he could. Lis, Jenn, Dr. Flaherty, Alesha…without you all we would not have Oreo were he is today!!! We can not thank you enough for your dedication, support and love that you have shown to us! Oreo had another visit with Lis today. A month had passed since our last visit and Lis continues to see improvement. One day in July of 2009, we were at our veterinary clinic for a visit with one of our cats. A family had recently left a handsome yellow lab with Doctor Kibiuk, Doctor Jank and staff at the Watertown Animal Hospital. 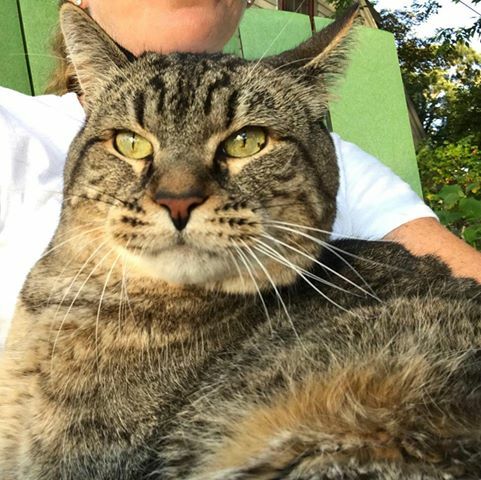 His name was Hemi, he needed surgeryon his left knee, and the doctors were hoping to find a new family for him but knew it would be difficult. They mentioned him to us since they knew we were looking for a dog to adopt. We met him once and that was all it took. He came home with us that dayand we learned quickly that he was a happy, friendly and very energetic guy. In October of 2009, Doctor Jank successfully performed surgery on Hemi’s ACL in his left knee. Around the same time, pre-existing skin allergies became increasingly worse and unbearable, and he ended up having 2 hematomas, one in each ear, and 2 surgeries as a result. After several years, and several medications that didn’t work, we went to Cornell for allergy testing. Hemi now receives allergy shots and Apoquel and can get through the day and night without scratching continuously. Hemi loves walking in the fields and woods, and one day turned to look backwards and his right knee buckled! Another torn ACL and another surgery performed by Doctor Jank. Unfortunately, this surgery was not as successful and he had to go to Cornell to have a TPLO performed on his right knee. Throughout his recovery, it was a struggle to keep Hemi walking slowly, but he was learning and doing great, until he had a setback. Cornell diagnosed him with Peripheral Neuropathy and Laryngeal Paralysis. He continued to have trouble with his back legs, which weakened and caused pain and stress on his front legs as well. Throughout all of this, he has remained the same happy, friendly and energetic guy we first met. Desperate for help, we asked Doctor Jank if there was anything we could do for him. Doctor Jank talked to us about looking into acupuncture and physical rehabilitation and he recommended Veterinary Medical Center of Central New York. We called VMC the very next day and set up an appointment with Doctor Michelle Burnett on July 28, 2015 for acupuncture and pain management. We also made an appointment with Doctor Molly Flaherty to begin physical rehabilitation after she arrived from Chicago in early August of 2015. So began our visits at VMC weekly for physical rehabilitation and acupuncture treatments, along with pain management assessments, every other week. Our visits with Doctor Flaherty include laser therapy on Hemi’s joints, spinal manipulation and underwater treadmill treatments. Hemi does not like water and barked the entire time he was in the tank until Doctor Flaherty “out foxed” him. A kong filled with peanut butter, that he can lick, makes him forget all about the water he’s in. Doctor Flaherty & Jen have helped Hemi to maintain muscle mass, which enables him to have a better mobility. He can now enjoy his daily walks and move around the house so much easier. Doctor Burnett has helped Hemi be able to enjoy his daily activities more comfortably by introducing him to new medications and acupuncture treatments. She gets a workout during each acupuncture visit because Hemi is much more interested in visiting than standing still for the needles to be placed in position. Although, by the time the electroacupuncture machine is hooked up, he is worn out and usually dozes until the treatment is finished. Then, as the weeks went by we noticed that Hemi’s breathing was increasingly labored. This was due to the Laryngeal Paralysis and needed attention. At the beginning of the summer, Doctor Timothy Robinson performed Tieback surgery on Hemi to relieve the breathing stress. Hemi was then able to get through the summer without any further problems. We are so happy and fortunate to have Hemi as part of our family. Hemi just celebrated his 13th birthday at the end of October and we cannot thank VMC enough for everything they are doing for him. Our experiences with everyone at VMC has been outstanding! January 2017 Patient of the Month! When we adopted Stella in 2010, we weren’t looking for a young dog. We had our hearts set on a 9-year old female from German Shepherd Rescue who could be a companion to our 9.5-year-old male, Ezra. The 9-year-old female did not want to live in a house with other dogs, so the rescue steered us to Stella, a 2.5-year-old that had been surrendered by her family. We feel in love with Stella’s sweet personality and playfulness immediately. Stella and Ezra were running around and playing like old friends shortly after meeting so we knew she was the dog for us. Stella had a femoral head and neck osteotomy performed on her left hip when she was 6-months old after x-rays showed hip dysplasia. Despite this early setback, Stella is an extremely active dog who loves to play fetch and Frisbee. Occasionally we noticed that Stella was stiff after her playtimes. 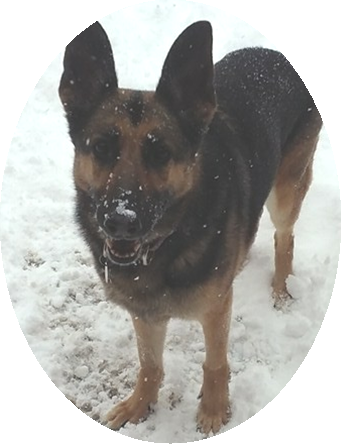 We brought her in for Physical Rehabilitation and Pain Management at the Veterinary Medical Center of CNY. Dr. Fleckenstein and Lis Conarton had worked wonders on our old shepherd, Ezra’s issues through the end of his life so we knew they would come up with a plan to keep Stella active. We immediately saw a decrease in Stella’s stiffness and recovery once we added physical rehabilitation. We have kept Stella on a 4 to 6-week rotation of chiropractic care and hydrotherapy and followed a regiment of home exercise and stretches. When we adopted Stella we knew she had anxiety issues. Having a strong male role model around helps with Stella’s anxiety but it is still a problem. Stella’s greatest problems occur during thunderstorms. We have frequently come home or woken up to find Stella wedged into a space that is too small for her. Stella has cut herself during these episodes but never caused an injury that required medical care. In early July, Stella panicked during a thunderstorm and wedged herself under our bed. The bedframe is very close to the ground. The only way Stella was able to get herself under the bed was to unnaturally contort her body. Stella was wedged in so tight that we could not pull her out. I was able to pull Stella out after my husband lifted the bed. It looked like she had rotated her hips at a strange angle so we weren’t surprised that she was a little stiff when she started walking around. Aside from the stiffness, she acted like her normal, playful self. The next morning when we took her out to play fetch it was obvious that something was wrong. She was not putting weight on her left hind leg. We brought Stella to the Veterinary Medical Center of CNY for evaluation and found out that she had ruptured her cruciate ligament. Dr. Robinson and the surgical team assured us that this was a common injury in active dogs and that Stella would be back to her playful self about 12 weeks after surgery if we followed a strict rest and recovery program. One week after Stella’s surgery we started Acupuncture. Stella had a lot of bruising and swelling around her knee and ankle and her leg was extremely hot to the touch. A few hours after her first Acupuncture treatment, the bruising and swelling had decreased significantly. We continued with treatments every two weeks through Stella’s 6-week post op x-rays. Once we got the all-clear that she was healing well, we were able to add Physical Rehabilitation with Lis. Visits with Lis for laser therapy were already part of Stella’s recovery but we were happy that now she was going to be able to do something active to burn off some of that nervous energy. At this point, we are almost 11 weeks post-surgery and Stella is doing great. Stella now comes in twice a month for her treatments with Dr. Polly and Lis and we follow our home exercise and mobility regiment. Stella is doing better than we expected at this point and is basically back to her old self. Even though some parts of the recovery process have been difficult, things would have been much worse without the great care and support that we receive from the VMC. You never want anything bad to happen to your pet but when it does, it is great to have such a great resource close by that embraces both traditional and non-traditional approaches to veterinary care. My name is Frostyn and I am an all white Siberian Husky. I am originally from Georgia and they say I was picked up as a stray. I knew where I was and I knew where I was going, but if “stray” makes everyone happy, then that’s okay. I was taken to a place called a kill shelter and fortunately, a rescue organization found me there and got me out. They put my picture on the internet and that’s how my Dad found me. Everyone thinks I’m about eight years old and I’ll let them go on believing that. As everyone knows, a lady doesn’t reveal her true age! In order to tell you about my journey with the Veterinary Medical Center, I have to begin by telling you about my “sister” Holly. Holly was also a Siberian Husky and even though she was six years older than me, we were the very best of friends. We were both agility dogs (I still am), but a couple of summers ago, Holly became lame. She couldn’t even put any weight on one of her front feet. My Dad was reluctant to use any of those medications on her, so he took her to see Dr. Polly Fleckenstein. To make a long story short, Holly made a complete recovery and returned to agility competition less than a year later because of what Dr. Polly & Lis Conarton did for her. Holly continued to see both of them and continued her agility career until she passed away a little over a year ago, so I have continued in the agility ring without Holly. My Dad has recently been concerned because, after my first run of the day, whether in class or in competition, I would always slow down. At first he thought it was all in my mind, but then decided he should make sure the problem was not physical. Of course, after the miraculous work done by Dr. Polly & Lis for Holly, the first place my Dad thought to bring me was the Veterinary Medical Center. My Dad had been taking me to VMC when he brought Holly for her appointments, so it was really good to see all my old friends. Everyone treats me so good when I visit. My Dad already had me on some supplements, but Dr. Polly put me on a couple more. She has been doing acupuncture and spinal manipulation on me and Lis is doing laser treatment on me. Lis has given my Dad lots of work to do at home, including stretching, massage, and exercises to strengthen my abdominal muscles. It’s only been a couple of months, but I feel so much better! My performance in class and in competition has been so much more consistent. Dr. Polly & Lis were able to tell where I was sore and concentrate on those areas. My lower back was really bothering me. As much as my Dad loves me and understands me, he doesn’t have the knowledge to be able to determine where I’m sore. It’s really important that I feel good since my Dad relies on me to keep him busy. In addition to agility, I take him to rally/obedience class and we also compete in those events. Dad and I are also a pet therapy team with PAWS of CNY. I take him with me to schools where the students read to me and to a home where the people don’t remember me each time we come. We have also done some other activities with PAWS of CNY such as de-stress events at Syracuse University and participated in 4th of July parades. I’m going to make sure my Dad continues to bring me for treatments with Dr. Polly & Lis so that I’m at my best. Without me to keep him going, I’m afraid he would get bored and lazy! Hello, my name is Blackjack, everyone calls me Jack for short and my friends at daycare call me Jack-Jack as they have decided I like to hear my name. I am Lord Blackjack of Rambunctiousness as it could be seen by the look in my eyes I was destined for trouble from the very beginning. I am a 7 year old black lab. I was having various limping episodes and had gone to see Doctor Goetz and Doctor Rodriguez at Manlius Veterinary Hospital. It was decided they needed an X-ray to confirm that I had a cruciate tear. Once that was confirmed I was sent to Doctor Robinson at Veterinary Medical Center for a consult for surgery. We discussed my options and decided that for my size the TPLO surgery was the way to go. The left side was also showing a tear so it was explained that the likelihood of the other side needing surgery at a later time was probable. So I had surgery in October and the follow-up X-rays as scheduled. I had not healed as fast as expected, (probably due to my inability to sit still) and required more time of sitting watching DogTV. Now don’t get me wrong, DogTV is great but I had things to do. My Dad had heard that Lis would be great to help with recovery but she was booked weeks in advance and I just could not wait. So we made our appointment with Doctor Molly Flaherty and started laser and treadmill therapy. I get my chiropractic adjustment, too. And there was water involved! My first session was all about what was expected of me. Once we got the hang of it and toys got introduced I was hooked. As expected four months after the first surgery the left leg was weakening and I needed another TPLO on that knee. Doctor Flaherty suggested starting laser the day after surgery and what a difference it made. It made a real difference with swelling and I healed a lot faster. I wish I had known for the first TPLO! Since December I have been a weekly patient of Doctor Flaherty. I have laser and cannot wait for my turn at the water treadmill; splashes for everyone! I love coming to VMC for water fun, visiting friends, hugs and cookies. My four months recovery after the second surgery is over I still want to continue coming to help build more muscle and maintenance for elbow dysplasia. The goal is to be able to go back to daycare and play with my human and canine friends. There are more lakes out there to play in. I am so thankful that Doctor Flaherty and Jen Waldron were able to help with my recovery and future success in having fun and making people happy. Bailey is a 10 year old Golden Retriever who was named after Bailey’s Irish Cream as he became part of our family the day after St. Patrick’s Day, 2006. At the time, he joined our 6 year old Golden, Reilly, and our calico cat, Callie. Bailey had always been an easy-going, healthy dog who loved his walks, had the run of our one acre yard, and couldn’t wait for summer so he could jump into the family pool. In early October 2015, Bailey decided to take off after the neighbor’s cat who was visiting in our yard. Running full speed ahead, he rounded a corner and went down with a yelp of pain. At that time, he lost use of his back end and could not walk or even support himself. He was transported to our vet at Stack Veterinary Hospital for evaluation. They did x-rays to evaluate Bailey, found no sign of any breaks, and felt he should be taken to the Cornell Companion Animal Hospital for a more comprehensive evaluation. At Cornell, after an MRI, Bailey was diagnosed with an intramedullary lesions at T12-13 and multiple intervertebral disk protrusions caused by Lumbosacral Syndrome. The doctors at Cornell noted that he had some use of his right rear leg but no use of his left rear leg. They recommended that he remain at Cornell for several days for pain management and observation. Over that time, Bailey’s pain seemed to diminish somewhat and his ability to use his right leg improved. He was, at this time, discharged with the Help ‘Em Up harness so that we could help him get around. Through all of this, we were in constant contact with our wonderful next-door neighbor, Doctor Maureen Luschini from the Veterinary Medical Center. She gave us advice and helped us make sense of the “vet-speak” that we did not always understand. When Bailey came home, he really had NO use of his back left leg and was completely immobile without our help. His left rear limb hung limp and literally dragged on the ground unless we picked up his hind quarters using the harness. Cornell gave us exercises to do several times daily and recommended 5 minute walks around the yard. In talking with Dr. Luschini, we learned that acupuncture was available at Veterinary Medical Center and felt that this might help stimulate the nerves and muscles in Bailey’s leg and hasten his recovery. He started his acupuncture treatments with Doctor Burnett about a week after he came home, and has continued with those treatments to date. Along with the acupuncture, Doctor Burnett taught us other stretches to do daily. We began to see improvements with Bailey’s ability to bear weight and actually stand on his own. We made a return visit to Cornell about six weeks after the initial episode and they were immensely pleased and pleasantly surprised with the progress Bailey had made. At that time they recommended physical rehab. 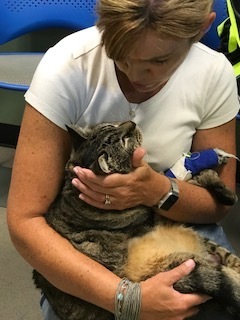 We were so pleased with the care he received at Veterinary Medical Center, we decided to have his physical rehab done there also. We consulted with Lis Conarton, their canine rehabilitation practitioner. 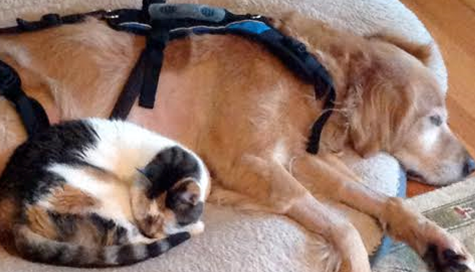 Bailey started seeing Lis for laser therapy, massage and workouts using the underwater treadmill. It was a joyous day indeed when the harness came off for good and Bailey was able to walk on his own. We are so happy to say that Bailey has continued to improve. Although he walks with a limp, he is back to most of his normal activities. You can imagine our elation when Bailey actually ran for the first time since his accident. He continues to see both Dr. Burnett & Lis, and looks forward to these visits. He is anxiously awaiting his first swim in their new rehab pool! Thanks to the exceptional care Bailey is receiving at the Veterinary Medical Center, we are thrilled to have our Bailey back. This handsome boy is Oliver, the love of my life. He is a Maltese/Shih Tzu who will be 17 on July 22nd, 2016. Happy Birthday to my boy! Oliver’s first visit to the Veterinary Medical Center of CNY was in July 2004 with corneal ulceration and corneal edema of the right eye. We were referred to Doctor Burgesser who began treating Oliver for dry eye with ophthalmic drops. Doctor Burgesser continued to be his Ophthalmologist until his retirement from VMC in January 2016. Oliver started having back issues the beginning of 2012. His veterinarian, Doctor Stokes-Cowley at Lyncourt Veterinary Hospital took radiographs and diagnosed the beginning of disk disease. He was given NSAID, pain and antispasmodic medication. Oliver was also seen at VMC in 2012 and 2013 for recurrent episodes. In November 2013 when the spasms became severe, he was seen by Doctor Fleckenstein, who diagnosed Oliver with Intervertebral Disc Disease. After her assessment , Doctor Fleckenstein prescribed laser acupuncture along with medication and supplements. I was also given exercises for Oliver at home. Without her present regimen, I do not believe Oliver’s quality of life would be what it is now. Thank you to Doctor Fleckenstein and Sue for the love and treats you spoil Oliver with. Raji started coming to the VMC in the summer of 2013, when he was 12 years old. He had been showing some signs of arthritis, especially in his back legs and part of his back. Sometimes he was also reluctant to go out on walks and we started to wonder if he might be having some pain. We’d gotten him on some supplements that our veterinarian (Dr. Capparelli) recommended (which definitely helped). However, it seemed like he needed something else to help with the stiffness and increasing reluctance to walk for as long as he used to. Our vet thought acupuncture from Dr. Fleckenstein here at the VMC might help to reduce pain and increase mobility. Raji started seeing Dr. Fleckenstein and right away we noticed a decrease in the amount of twitching in his back when we petted him in certain areas. He also seemed to have more energy, and he was more interested for his normal walks. He also liked coming to see Dr. Fleckenstein and Sue, who assists with most of our visits and also gives great massages and treats! There is always a calm atmosphere and I think Raj feels very cared for. Dr. Fleckenstein has definitely helped with keeping Raj comfortable in his own body as he ages. She has helped to keep down pain and inflammation from arthritis, and worked out trigger points with the laser and needle acupuncture. Dr. Fleckenstein also recommended a ramp for getting him in and out of the car. This ramp has been so helpful, and it is light and easy to set up; he couldn’t get in the car without it! In the fall of 2014, Raj started seeing Lis for Physical Rehabilitation. Dr. Fleckenstein recommended her and said she could add another dimension to his care. Lis started doing laser therapy and massage to release the increasing number of trigger points he had, and also made exercise suggestions for home. He liked coming for the rehab sessions and was very comfortable with her and her caring, gentle and friendly demeanor. At first Raji had to get up a few times during the sessions to “shake out” after her manual trigger point release, but as Lis worked with him and the trigger points became fewer, he could sit for whole sessions quite often as she worked her trigger point release magic! Lis also shows me various exercises to do with him. She gave some simple exercises and massage techniques for us to do at home to keep his range of motion as good as possible. We also do the massage techniques she shows us so we can keep some of the trigger points at bay. With the sessions with Lis, we can see changes in Raji immediately: he seems brighter and moves better after she works out all the kinks! Just a few days ago, unfortunately, Raji had a vestibular episode. Our vet and the folks at VMC were kind enough to lend a hand. The VMC lent us a special harness to help him get up and walk. So far, he hasn’t been successful, but we are working on bringing him back to his old self. It is nice to know everyone is concerned and willing to help Raji get better. We look forward to resuming his therapies soon! Petunia was the runt of her litter and we believe that is why her spirit is especially strong. Since the day she came home with her brother Ruben, she has made it very clear that she is the alpha. Although she may be tiny, she has always gone out of her way to prove that she is the ruler of the roost. It is especially humorous since Ruben and the rest of the animals could not care less. At her very first vet visit, the doctor warned that she was a 'lemon' and she should be returned to the breeder. Obviously, this was out of the question. Shortly after several consultations, she was taken to Los Angeles at just 3 months old to have surgery on her heart. The procedure was very successful, reducing her heart murmur significantly. We were so relieved and Petunia's new strength was remarkable. 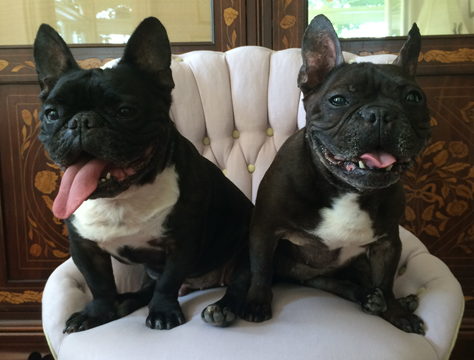 Growing up in Sunny San Diego, the two Frenchies frequented dog beaches and parks; playing fetch was their favorite thing to do! Petunia was fast and coordinated, bounding to get her ball. Unlike her brother who often tumbled and fumbled the ball -- he usually held on to it for dear life, knowing Petunia would happily have both balls to herself. It was not until Petunia was 9 years old that she showed a change in her gait. At first it was just once and a while, when running full speed for her ball, that her hind legs would go limp. She hardly seemed to notice and would still propel herself for the ball. After several similar occurrences, we decided to have her seen by a neurosurgeon in Northern San Diego. After examining her, it was predicted that she had bulging discs in two parts of her spine. An MRI would confirm if surgery was even an option, knowing that surgery would only prevent more damage from being done, but would not reverse any of the immobility that she was already experiencing. With Petunia's heart condition and age, anesthesia for the MRI was not encouraged, let alone for the intensive surgery that may follow. The doctors noted that any pain she was experiencing was not affecting her attitude or eating habits and that we should proceed by minimizing her exertion at the park and try some anti-inflammatories to see if that may relieve any pressure in her spinal column. She tested out some mild steroids with little benefits. Meanwhile, a move to Boston was in process and soon she met with the doctors at Angell Medical Hospital. First she saw the neurosurgeons and heart specialist, seeking second opinions and advice on how to proceed. At this point she was becoming more and more wobbly in her hips- coined as 'drunken sailor' movement. Her spirit was still strong, but she was not able to move like she once had. After concluding that any operation was too risky with no guarantee of positive results, she went to see Dr. Lisa Moses for acupuncture. After Petunia's first visit with Dr. Moses, she was noticeably more comfortable and showed strong action in her hind quarters. She found relief from pain and reduced inflammation immediately and it seemed like a miracle. As almost two years passed, Petunia's condition did continue to worsen, as expected. She tried out water therapy and was fitted for some wheels. Still, it was obvious how much she rebounded after acupuncture. Her relief was visible and her love for Dr. Moses was palpable. When Petunia moved to the Syracuse area, Dr. Moses recommended the VMC and Dr. Fleckenstein. For almost a year now she has been working with Dr. Fleckenstein and Lis. For the first time she was given exercises and stretches to work on at home. She started taking Chinese Herbs and has minimized her steroid intake, with positive results. She looks forward to her weekly visits to see Dr. Fleckenstein, Sue, and our other lovely assistants. With ample treats and comfy bedding always set up, Ruben enjoys almost as much pampering when he comes along to accompany his sister. Together, we are all forever grateful for their tender and thoughtful care. We simply cannot thank you enough! Acupuncture, Electroacupuncture & Lacer Acupuncture for Pain, Nerve Stimulation, Heart Disease, Urinary and Immune Support & General Well Being.